Banks and asset managers that are first movers in fintech reap big rewards, says a Simmons & Simmons Study. Fintech start-ups has attracted growing investment over the past few years, according to a study titled “Hyperfinance” by Simmons & Simmons and Longitude Research, with global fintech investment reaching a record high of US$46.7 billion in 2015. While it dipped to US$24.6 billion in 2016, corporate venture capital activity was up, as banks and asset managers acquired finance solutions being spearheaded by fintechs, the report noted. According to Hyperfinance, which surveyed 200 senior-level respondents from large banks and asset managers, only 7 percent feel that they are industry-leading in digital innovation. This acknowledges that large firms struggle to act as first-movers, and the report further suggests that first-movers in fintech could reap some huge rewards. The study added that the most innovative institutions are more likely to have grown revenues and seen better returns from their new products. 79 percent of the firms ahead of their peers in digital innovation, or “innovation leaders” reported revenue growth over the past 12 months, versus 49 percent of other respondents. They attribute the revenue growth to digitally-driven products and services that they have launched over the past three years. About three-quarters of respondents feel that they are hampered by complex digital making procedures, said the report. Only 19 percent feel that their procurement process to be effective in enabling collaboration with fintech firms. Cybersecurity is a key concern as well, with 71 percent of respondents citing it to be the most significant risk when partnering with fintech firms. However, 60 percent of respondents think some existing consortia are ineffective in on-boarding fintech because these consortia have too many stakeholders. How do banks improve their digital innovation capability? deliver proper access. So it’s this legacy complexity that is making it very difficult for fintechs to work effectively with banks,” said Nigel Verdon, CEO and Co-founder of Railsbank. Realistically, collaboration may also pose challenges from an organisational standpoint. 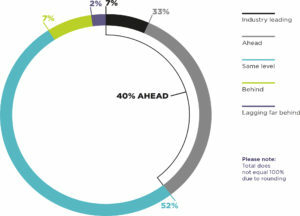 54 percent of respondents are concerned about ahieving the required return on investment. The same number of respondents are also concerned about aligning different organisational cultures or ways of working. 53 percent feel institutional rules may limit their ability to provide services to fintech companies. It will not be an overnight change for established financial institutions to adopt fintech efficiently. But what can the rest of the industry learn about the tactics leaders are using to improve outcomes? The report noted that in the past three years, 55 percent of respondents are investing in building in-house fintech expertise, with 43 percent setting up new business units to deliver fintech products. 37 percent of respondents are establishing joint ventures with fintech companies, while 41 percent are setting up accelerator or incubator programmes for fintech startups. While there is a strong desire for instiutions to own intellectual property (IP) when working with fintech firms, this could hinder effective collaboration. Gary Chu, Global Lead Lawyer for UBS’s FinTech Innovation Lab, shares the same view. He argues that the industry should move away from a mindset where institutions always feel the need to own IP outright. Regulatory risk, however, is viewed as an obstacle to fintech acquisitions. Nearly a third of respondents expect to acquire a fintech startup within the next 18 months, while 45 percent within the remaining two thirds cite concerns about regulatory risk as a key deterrent. Penny Miller, Financial Services Regulation Partner at Simmons & Simmons, said the relative infancy of the FinTech sector, and a regulatory framework that isn’t tailored to emerging FinTech business models, creates challenges for institutions and asset managers seeking to understand the regulatory position of a business. The study’s results suggest a surprisingly strong investment appetite among banks and asset managers for the next 12 to 18 months. 32% expect to undertake corporate venturing focused on the FinTech sector, while 31% expect to acquire a FinTech firm during this time. Among respondents in New York, two-fifths (39%) are eyeing up FinTech deals over this period, compared with just 29% in London and 21% in Hong Kong. Ian Wood, who heads Simmons & Simmons’ corporate and commercial practice for Asia, says that the market in Hong Kong is relatively immature in comparison with other financial centres. In Hong Kong and Singapore, 66% say that a lack of certainty about the best targets is spoiling acquisition appetites. It is the region’s top barrier to acquisition. The report also showed that banks and asset managers prefer corporate venturing to outright acquisition of FinTech firms. The approach has several advantages. It is lower risk, given that less capital is required. At the same time, institutions can choose how closely they want to engage with the target firm. This helps to control, where appropriate, the direction of technology development, said the report.